Laura Mercier recently has launch a new foundation and I am so excited! Glad I have the opportunity to try it as I am looking for a good high end foundation to try. I saw itsjudytime review it and I am so excited to try it for my self. It comes in a sturdy sleek plastic tube that you need to shake it off shake it off at least for 10 seconds to activate the formula before using it. Put at the back of your hand and use a brush or hand to apply it on your face. 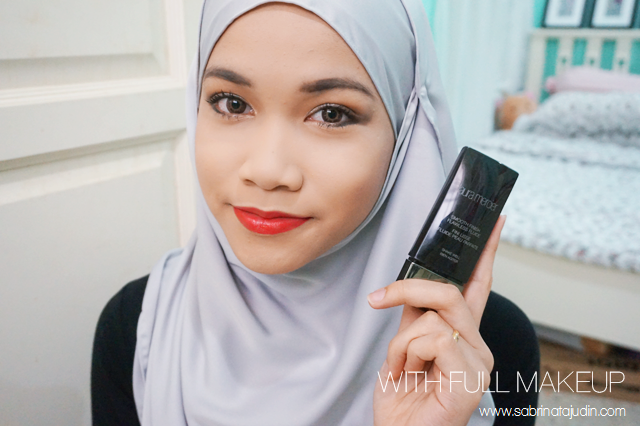 They also recommend you to use their Laura Mercier Foundation Primer before using this for best result. My Laura Mercier Smooth Finish Flawless Fluid Foundation is in the shade Macadamia which describe as - light with warm undertones. The new Laura Mercier Smooth Finish Flawless Fluid Foundation claims to be a revolutionary bi-phase, two part formula is designed to deliver the most natural looking colour and lightweight coverage. Colour true pigments rest at the bottom of the package while reflective waters (Hydro-Brilliant Technology) float to the top. Vigorously shaking the package before each use ensures the pigments blend with the reflective waters to create fresh colour every time. Long-wear (12 hours). Humidity-proof, sweat-proof / water resistant. Oil-free; non-comedogenic. Non-greasy; non-drying. Dermatologist tested. Suitable for all skin types (including sensitive skin), especially normal-to-oily skins. This is maaa bare face! With only moisturizer on top. I have redness around my nose and small pores around my upper cheek and T-Zone. Let see how this covers up. See below. Uuu.. Pretty nice. What I can see here is that it covers up and my acne spots pretty good. My spots looks fairly look reduce and my redness is covered up. My pores are also "filled" up/blurred and look smoother. But for me it looks a bit drying a few seconds. After a few minutes when it sets, it leaves my skin beautifully matte. Here is my finish look. I finish of the foundation with the rest of my makeup steps. 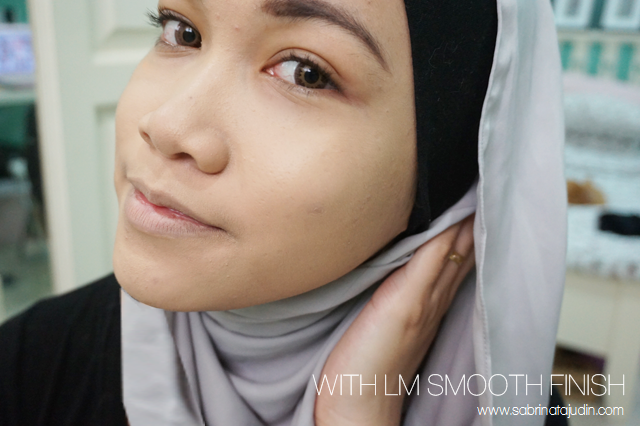 I use the Laura Mercier Secret Concealer in the shade no. 2 and set it all up with Laura Mercier Translucent Powder. For the other part I thought of pairing it with a simple eye look and red lip to compliment the "theme" of matte finish this foundation gives me. 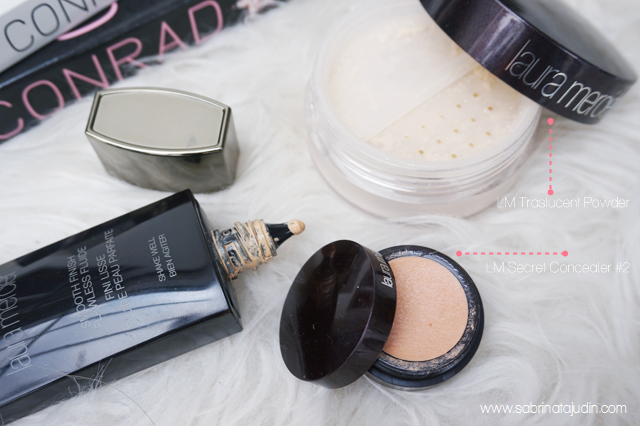 I think its a great combo with all these 3 Laura Mercier products. What I like about it. It really blends do nice on my skin. It's lightweight but build-able. The coverage is build-able but not too thick. Love the light-weight feels so comfortable on the skin. It sets on my skin quickly and the best part it, it does not transfer easily (It's means that like some type of foundation that is too dewy and gets on to your hand when you touches it). It sets from liquid to a nice semi-powder texture on the skin. It just sits right there on my skin and even out my pores smoothly as you can see for your self in my before and after picture. The matte air brush finish it gave makes selfie even better. It looks so nice on camera. Although it recommend me to use a primer first, which I did not use. It stills looks good. What I don't like about it. Messy! Every time when I open out the cap, the liquid foundation tends to drip out. For price wise I got to admit it is a bit pricey and since it is a liquid type of foundation I think this is going to finish off quickly. I basically need nearly 20cent size of this Smooth Finish Flawless Fluid Foundation to cover up my whole face. I basically need more because I love a nice coverage type of foundation. I would wear this on special occasion to save up. Haha. Overall & Recommendations. Really recommend this foundation if you are looking for a high end foundation that gives you non-cakey matte finish. This works well with Oily to Combo skin because it is not formulated with oil and it is water base. I have combo skin and this works really well on me. It's not oily or too drying. The matte finish is not too flat where I find this foundation gives a very nice "velvet skin" effect if you get what I mean. Finish it of with a good light weight powder, don't set if of with another powder type foundation. I think it will just too heavy since this has a powder matte finish. I found that this works well with a synthetic brush as well as your finger. I am in the shade Macadamia, and it matches my skin so perfectly. It even out my skin tone and covers my imperfections pretty good. I just need a few layers of concealer to finish it off. I tested this out a few days ago when going to work. So far it stays pretty good long hours. Not really 12 hours. Wore this in the morning, I can see that it is pretty good during lunch hour but my spots can already be seen. In the evening the foundation is still there bit fades out a bit with a bit of oiliness not on my entire face but just around my T-Zone and remains smooth around my cheeks. With 24 shades to choose from, I bet everyone has its own perfect shade! Check out Beauty Blogger Evonnz LM SFFF review here, she has a quite nice swatches for you to refer. Recommend! 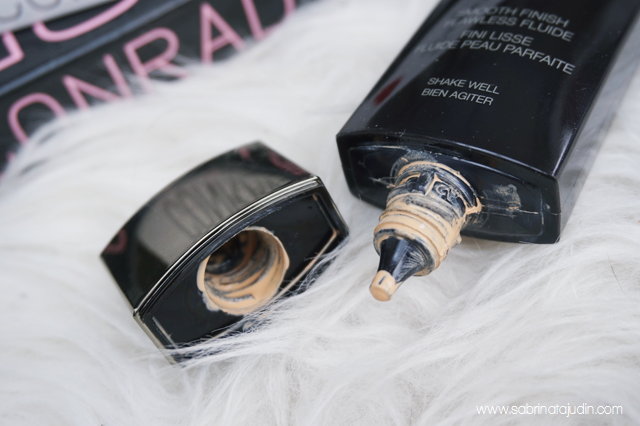 A good high end liquid foundation you can try out! Hope you find this review helpful and we see again in my next post. In shaa Allah. More info go to their Facebook page as well as Instagram. Toodles! plus make a tutorial for above make up please ! I'm torn between getting this or Nars one. the finish is indeed gorgeous! It's good to hear that this works for my skin type. Great insight! Thanks for sharing, babe! i havent tried nars. so cant help you out with the choices. hehe thanks dear! yep, its dripping! but i guess it happens to all liquid type products. Ahaaa.. agak pricey di situ.. hehe.. still looking for the best foundation yg sesuai for my face..
maybe sebab tak cuci betul2 makeup sebelum tidor. even dah basuh muka, foundation still ada dekat kulit and susah nk nampak sebab dia sama warna dengan kulit kita. so my tips is, pakai baby wipes dulu, lap muka betul2 and then baru bauh muka. The foundie looks good on u :) but maybe its a pass for me coz i have a dry skin.the packaging..i wish they would come with a pump instead..i agree it's a mess :(..good review sab! Thanks dear! <3 but i really love this foundation, always get question what foundation i use from friends when im using this. Beb, I have this foundation. The well renown foundation and it looks best in photos. But most of the complaints are also oxidization.. grey habis at the end of the day beb. Im in cream ivory the fairest of the shade they have in malaysia.. tu pn dark sikit for me. Imagine after oxidized... lagi lah. Well, this foundation isn't humid and heat friendly too.. They all kt sne bnyk letak product kt muka... Kita org malaysia ni mmg kulit dh cntik(thatstruefact)... Cntik dr segi seri.... Meanwhile they r dull x de natural glow. Perasan x beb? Your make up is really beautiful!Pls do a tutorial on that! And..can i know the price for the translucent powder?